Did anyone else catch "Empire" on ABC last night? You know, the miniseries that looked exactly like "Gladiator" except the made-for-television part? After watching it my only thought was, "This is the least original thing I've ever seen." It was god awful. My advice, avoid "Empire" at all costs. The time has finally come for me to deal with my wisdom teeth. Well, tooth to be exact. I was blessed with only one wisdom tooth and not the usual four, but I was told today by an oral surgeon that it has to be removed. From the x-ray I can tell that it is impacted. Bummer. The surgery is scheduled for next Thursday and I’ll have to take the day off from work because of the anesthesia. I’m really not looking forward to this. In other news, I spent the weekend in San Diego with my parents. There’s not a lot there for tourists, but I loved the Hotel del Coronado. What a beautiful place. That ice cream wasn’t bad either. Courtesy of the “Sleeping Beauty” special edition DVD, the results of the Princess Personality Profile are in! P.S. I am totally addicted to "Into the West." Dan is my everything and there is no way that I’ll ever forget him. Happy anniversary, Dan. I love you! Reading what I wrote nearly four years ago makes me happy. Just like Dan. I am wide awake thanks to staying up too late to finish reading a book. And since I am awake I thought I should mention that "tsu-tsumi" in my previous post is pronouced "soo-soo-mi." I realized that I left the explanation out and it might have made the post more understandable. Now I'm going to make my lunch for tomorrow and go to bed. Good night. Location: Dan’s house. Date: June 14, 2005. Time: Sometime between 9 and 9:30 PM. I spend most of my time questioning my genius (except for a brief moment this afternoon, represented by my previous post) so now I am back to normal. At the time of the last post I thought I had just figured out how to greatly simplify something I was working on. And I was almost right. It turns out that implementing my stroke of genius is harder than it I thought it would be. My eyes were starting to cross around 4:30 PM so I decided to call it a day. Despite the difficulties I am still determined to make it work. I’ll just have to make it work on Monday. I was sitting in my cubicle in Seal Beach (the one I hardly ever use) when the earthquake started. It only lasted a few seconds, but I felt totally helpless. I couldn’t remember what you’re supposed to do during an earthquake! Something about doorways, but I was in cubicleland where there aren’t too many of those. By the time I realized I should do something the quake was over. I immediately went to the computer and checked out the USGS Earthquake Hazards Program webpage to find out how strong and how far away it was. At this point the website lists the earthquake as a 4.9 and it was centered a ways south of Seal Beach. We certainly felt it there, though. Maybe I should read up on what to do during an earthquake now. In the event of a major quake I want to be prepared. At 8:45 PM I was watching “Gilmore Girls” when the Emergency Broadcast System came on with a TSUNAMI warning. After turning to the indicated channel I learned that a magnitude 7.0 earthquake off the coast of Northern California had possibly triggered a tsunami that would affect the West Coast from Mexico to Vancouver. People on the water were urged to go inland to avoid the possible wave. I stood in my bedroom in shock trying to figure out what to do. Living three blocks from the beach I’m about as close to the water as you can get. All of my neighbors decided to leave so I called Dan’s house and asked his grandmother if I could come over. Before I got there I heard on the radio that the tsunami warning had been cancelled shortly after it was issued. The earthquake was too deep to cause a shift in the ocean floor so the West Coast was safe. I spent an hour at Dan’s so I could calm down, but I’m home again now. I’m going to bed now, but I’ll post more tomorrow. Good night. After aerobics today (which killed me after three weeks away from the gym) I went out to the Boeing softball field for some batting practice with Dan. He bought a tee over the weekend and we took turns hitting and fielding. For me, hitting consisted of trying to remember how to swing a bat and fielding consisted of chasing Dan’s hits in the outfield that I was too out of practice to get in front of. Dan did much better. If I ever aspired to play softball again I’d need a lot of practice, but I was pleased to see that I hadn’t forgotten everything. I didn’t miss the ball when I was batting except that one time I hit the top of the tee instead. And that was my first swing so I consider it a huge accomplishment. P.S. Dan is going to aerobics with me tomorrow. Yeah! I went to the gym with Dan on Thursday and lifted weights. I’ve been saying that I’d go for a while, but I didn’t get around to it (for several reasons) until this week. My goal is just to get a little more toned, but Dan calls it strength training. Whatever works. I was a bit sore on Friday, but I am starting to feel normal again. The Huntington Beach aerobics instructor will be back from her vacation tomorrow so I’ll be back to my normal workout routine. Thank goodness. I’ve been trying to change my eating habits lately and I’ve succeeded in eating more fruit and vegetables, but I have only been to the gym twice in two weeks. Now I’ll go to aerobics three times a week (not four times since the Wednesday class has been cancelled until July) and I am planning to go to the gym with Dan again on Wednesday. I am getting closer to wearing my bikini and that’s cool. "When I get engrossed in a story it’s as if I become part of it – I think only of the present since the future hasn’t been written, although the pages I haven’t gotten to reading yet suggest otherwise." Now that it’s summer in Los Angeles I am even more “obsessed with sun protection” (per my April 22 post) than I was in the spring. I bought an SPF 40 lotion for my face and an SPF 18 lotion for the rest of my body today and spent way too much. I’ve tried the face lotion and it’s great, so if the body lotion lives up to my expectations both products will be well worth the money. Speaking of purchases, I may be “the proud owner of a pair of Steve Madden shoes” (per my May 30 post), but because of that fact I have almost no skin left on one of my little toes. I wore the shoes to work twice this week and then I needed band-aids to wear any shoes today. At least they’re cute and I think my feet will get used to them so I don’t regret the purchase. Yet. Update: It turns out the room does exist, I just couldn't find it. And I missed a very important meeting. Phooey. I bought tickets for Dan and me to go to the Hollywood Bowl on July 3 for the Fourth of July show. I went with his family three years ago and loved it. This year just the two of us are going and I am looking forward to it. So when and I found an envelope in my mailbox from the Hollywood Bowl this afternoon I assumed it was the event tickets, but it turned out to be bus tickets instead. In order to avoid driving all the way downtown and dealing with parking, I also bought bus tickets to take us there from the Lakewood Mall, closer to where we live. So now Dan and I have transportation to the Hollywood Bowl, but no guarantee we’ll be able to get in. I am desperately trying to eliminate soda from my diet. So far the longest I've gone without drinking any is six days, but the recent baseball games Dan and I went to derailed my efforts. I was so tired at work today I almost gave in, but I made it through the day drinking water instead. I’m hoping that the five hour nap I took when I got home this afternoon will eliminate the need for caffeine, at least for tomorrow. I think the second half of my document review tomorrow afternoon will keep me awake instead. Wish me luck! 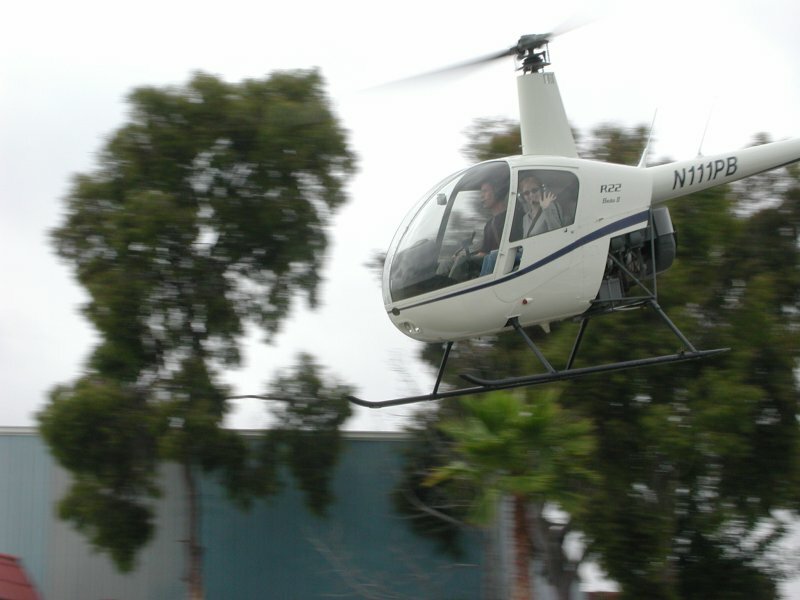 If it wasn’t obvious from the picture that I went flying in helicopter yesterday and then went to a Cubs vs. Padres game with Dan, I decided to post the rest of the pictures as further explanation. They can be found in the “June 4, 2005” section of my online photo album. Dan and I got some good shots of the San Diego coastline on the helicopter tours that Dave Shear was good enough to take us on. Then we got to watch the Cubs beat up on the Padres. It was a long day, but we had a good time. It was a good weekend. I had the second formal review of my document at work on Wednesday. At least I had part 1 of the review because two and a half hours wasn’t long enough to get through all of it. Because it was at the “Draft 2” stage the document was supposed to be almost complete, but it wasn’t for several reasons – most of which were not my fault. Part 2 of the review will be held on Tuesday and then I can relax a little. Since Wednesday I have been scrambling to add details (in between meetings) so that the rest of the review will go smoothly next week. I got a lot of work done today because everyone seemed to have taken the day off. With the five hours of sleep I got last night I wish I could have done the same, but I don’t have much vacation time saved up yet. Maybe next year when I stay out past midnight three nights in a row I’ll be able to stay home and sleep. After the Cubs beat the Dodgers last night Dan and I saw this car in the stadium parking lot. 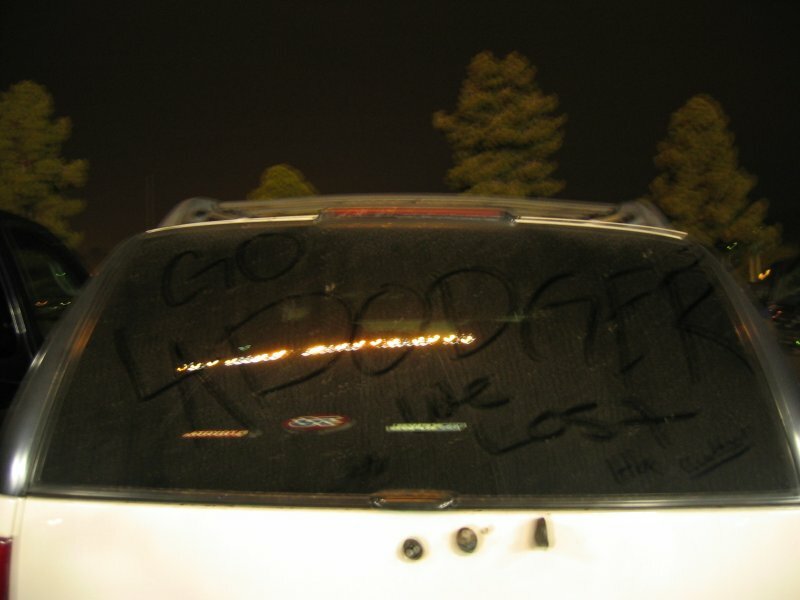 Apparently is belongs to a fan who wrote “Go LA Dodgers” (a little convoluted) in the dirt on their car, but a Cub’s fan added to the message after the game. The picture is a little blurry because I took it without the flash, but underneath the Dodger fan’s writing is “We Lost” and “Ha, Cubs.” It made me laugh. I’m still tasting garlic fries from the Cubs vs. Dodgers game Dan and I went to last night. The game was exciting and the Cubs won so we had a good time. We even got to see the Dodgers extremely popular relief pitcher, Gagne, pitch in the ninth inning. We’re going to the game tonight too so look for us on ESPN 2. Not that there’s much chance of seeing us, but I thought I’d mention it.